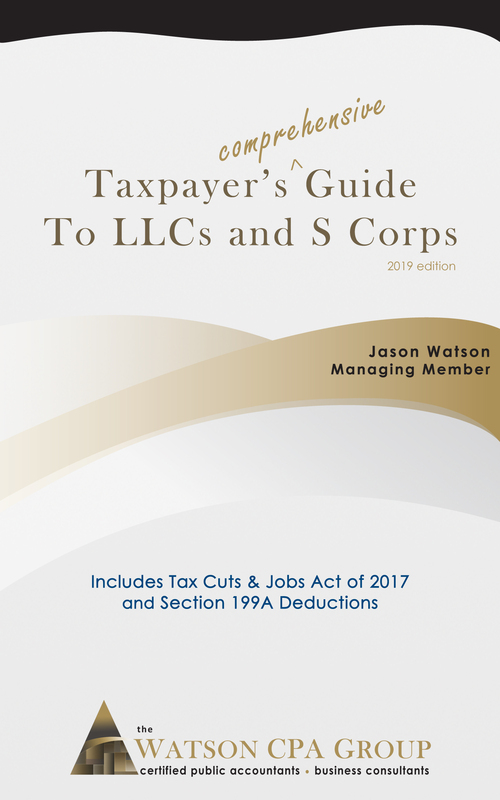 The Watson CPA Group just released the 2019 Edition of our book on LLCs and S Corps. We did a quickie redo in January to get something out on the Section 199A qualified business income deduction plus a few other notables like meals and entertainment. Later in August 2018, the IRS and the Joint Committee on Taxation released Proposed Regulations 1.199A to offer some additional insight to Section 199A. The Tax Adviser, Bradford Tax Institute, Kiplinger’s, BNA Bloomberg, the IRS and several others have been publishing articles and snippets on various issues facing small business owners. Our book is built for the small business owner who is wondering about entity structures, late S Corp elections, reasonable shareholder salary, how payroll works, small business tax deductions and retirement options. However, our book is also written for other tax professionals who might need references and assistance with their own client’s unique situation. We continuously help other professionals as a pay-it-forward giveback, and our assistance is usually complimentary- hey we are all in this together. Our book is written in a conversational tone. If you like perfect prose and editorial exactness that you would expect in a book on brain surgery, then we will be disappointing. We make jokes, some of which are only funny to ourselves. We don’t have the best punctuation. We might even have a missing word or a misspelling. We are nerdy accountants who did everything possible to avoid English literature and writing classes. It is available in paperback for $24.95 from Amazon and as an eBook for Kindle for $17.95. Our book is also available for purchase as a PDF from ClickBank for $12.95. Apple iBook, Barnes and Noble Nook, among others are being updated… since these formats are more “static” and given the quantity of recent revisions, etc., we are delaying these file formats. If you have purchased our book in the past, Thank You! But, wait, there’s more! If you provide us your order number and date from Amazon, Kindle, ClickBank or some other vendor, we will ship you a paper copy at no charge. Please send us an email to support@watsoncpagroup.com.